This is featured in a Tate Gallery magazine item called "The Emblem of Earthly Vanities", featuring art with shadows or other things that make us see an art object differently. But xoB found it here at a blog entry featuring shadows in art. 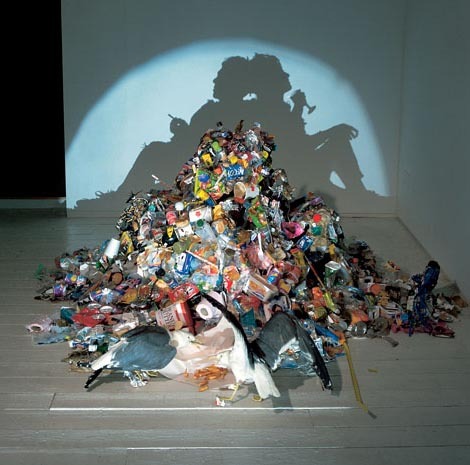 Credit Tim Noble and Sue Webster for the work entitled "Dirty White Trash (with Gulls)", 1998. And the interesting thing is... the trash shown is said to be six months of the artists' refuse. I think that is great. There are also some good ones on the Earthly Vanities website you posted. the trash shown is said to be six months of the artists' refuse. The artist threw away a pair of perfectly good seagulls? You know how it is. Those seagulls were SO last year! I think this one illustrates how the 3-D pile gives no clue as to what the shadow will look like. I'm in awe of people who think this stuff up. Is that Flint's drum set? I don't think that's the actual shadow. Certainly that's the case for HE/SHE piece (in that second link). They are all actual shadows. With the possible exception of Flint's. Bruce who? Bruce Lee? Bruce Almighty? Bruce the Shark? I don't recognize the 3D shape for that profile, Flint. Could you be more specific? Like a would be cartoonist that proves to be a childish AGer. No, really. If the sculpture that casts the shadow had a visual meaning of it's own, different from the shadow. That would be really tricky. That's what the thread is about. I'm not surprised you didn't know that.